All inventory lists that I have available are on the above link. Please see the tabs towards the bottom of the page to switch between different kits. Thank you to user jswareiv for the empennage kit, user Marabou for the wing kit, and user GeraldC for bringing the wing kit spread sheet to my attention. If we can get a moderator to sticky the link at the top of the RV14 forum it should be an easy find for everyone. Done, great idea by the way. Feel free to start populating this guys. I don't have my empennage kit yet so unfortunately I have nothing else to contribute at this point. Thanks Mike for getting this...um stuck. Great idea! As a first time builder (kits not even in the mail yet) I would reallllyyy not learn the hard way EVERY time! Were is the roll trim installation? You can order the kit directly from Van's - look for "EA 10 Kit"
I just did this kit - photos in my blog (see signature). I've broken the ice. I'm quite literate with Office products for years but not with "online" services so I'm not sure if what I've done is okay. Since the page was blank with no headers, I took the liberty of naming these as I think is appropriate and consistent with what you have suggested in the first place. I look forward to see inputs from other contributors. !! Thank you Marc for getting us going. 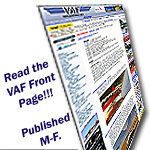 The idea of adding VAF reference links is perfect! I only changed one thing. I added the Kit before your page numbers. This will help with sorting later down the road when we have Empennage, Fuselage, and Finishing kits all going on as well. Marc, thanks for making the first entries! My wing kit sits on the floor as I finish getting the shop ready but I have already marked up my instructions with your comments. While the trailblazers found out the hard way, the rest that follow really appreciate documentation of these areas to avoid the same costly mistakes. I'm sure I'll make many but knowing about the landmines ahead of time certainly is the best way to avoid them. And thank you Jim for setting up the spreadsheet! Last edited by Tom023 : 09-24-2013 at 12:17 PM.